Lately I’ve been thinking about pincushions and about how my regulation tomato pincushion isn’t the most convenient thing in the world to use when I’m sewing. I saw the skinny pincushion tutorial from Green Bee and thought I’d try making one of those, but I decided I wanted it to be a little bit shorter. A little bit fatter. And it definitely needed to be hexified up a bit. 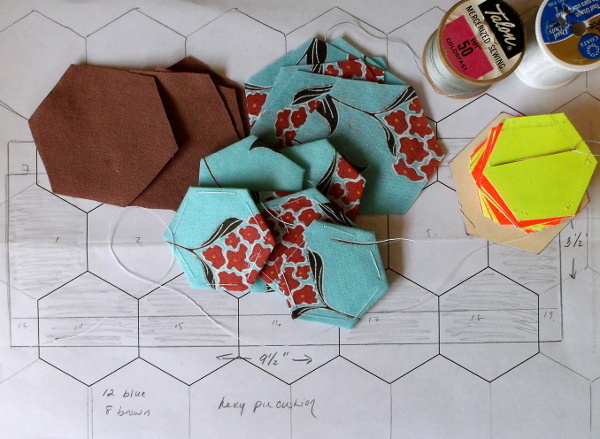 Then all of a sudden I was visited by the hexagon fairy, I guess, because I woke up this morning thinking about hexagons in this blue fabric. I think it’ll match my Morse very nicely. Have I shown off pictures of the Morse yet? I don’t think I have. It’s a Fotomatic III, model 4300, made by Toyota in (as best as I can figure out) the early to mid 1960s. Runs beautifully, and sewing on it makes me happy. I’ve been on the lookout for a plastic case from that era — I even have the top half to one, just not the bottom half. I’ve made some efforts to clean up the existing case, but that didn’t go particularly well, so my options now are to either find a plastic case (not too hard to find if I start looking — with broken sewing machine inside I could probably get one for $15 at auction. Even in good working order I don’t think I paid more than $35 for any of my machines) or peel the weird speckled stuff off this one, do some repairs to the wood case where some of the nails have come loose, and cover it with something else. A plastic case would be easier and a bit lighter, though light is relative when you’re talking about a 30-pound machine. On the other hand, part of me wants to refurbish the original case and make it pretty again, though it’d be a lot of work. 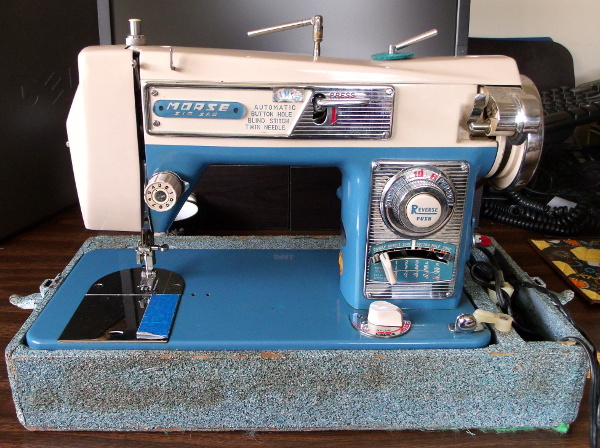 I also have a Singer 15-91, which is a pretty little straight-stitch workhorse, but no photos yet. Oh wow! What gorgeous machines! 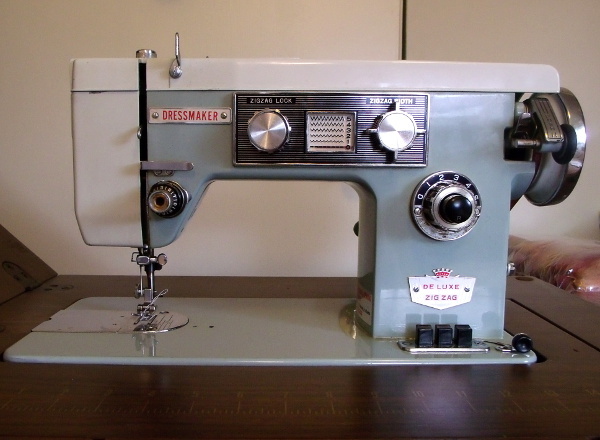 I’m dreaming of owning a vintage machine myself. These are real beauties!